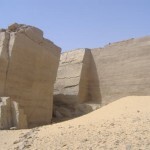 Gebel Silsila is located between Edfu and Ko Ombo and accessible only on a Nile cruise by a private sailing vessel, the big cruise boats can’t stop there. Judging by the guide books no travel writer has ever been there because only a paragraph or two is written about the place and yet there is so much of interest there. We used went there in a 4 cabin 2 bathroom lateen rigged sailing boat that can sleep up to 8 although there were only 4 of us. 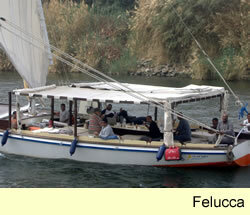 We drove to Edfu to pick up the boat and start our Nile cruise. As this is a sailing boat and we had opted not to be accompanied by a tug we were reliant on the wind to get us to our destination. It is interesting that in ancient times the hieroglyph for south was a ship in full sail. 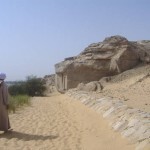 To go north the Ancient Egyptians used the river current. 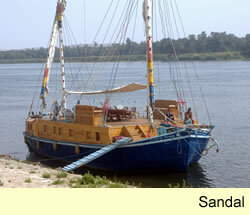 In fact there was no wind so we hitched a ride of a passing barge who took us all the way from Edfu to Gebel Silsila. We arrived there at night and to our pleasant surprise the site is floodlit and accessible. 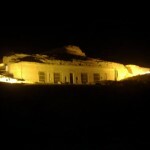 The actual Speos of Horemheb is closed at night but as it was protected by metal grills it was easy to see in. 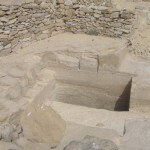 The area around it was also floodlit and ancient quarry work and rock cut tombs and chapels litter the site. In the morning we awoke to a direct view as we were moored right outside the chapel. So we breakfasted with the speos as a backdrop. On land the ticket was cheap and according to the ticket number over 2000 people had been here since they had been issuing tickets. So although not a popular site by any means, the Valley of the Kings for example can get 9,000 in a day, it is not totally unvisited. We had the place to ourselves and the guardians and policeman took great pleasure in showing us round, especially when they could see we were really interested. In fact the policeman seemed to know quite a lot about the site and was a very helpful guide. 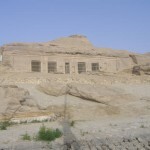 The speos of Horemheb is a rock cut chapel in the side of the mountain, t shaped with the top of the T facing the river. 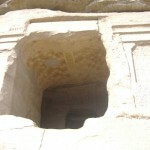 It has 5 openings and all wall surfaces are decorated. 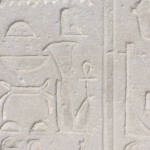 The end of the down stroke of the T has statues of Amun and five other Gods at the end and according to the guardian it gets lit up by the sun, similar to Abu Simbel, at certain dates in the year. The policeman related a story of a traveller or archaeologist named Castex discovered this phenomena and that is why there is graffiti there with this name on. 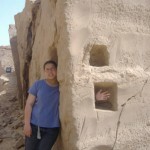 One of the pillars had also been excavated and had statues inside them. 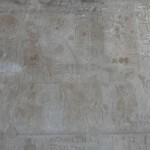 On the walls Horemheb is seen making offerings to various Gods, Ptah, Sehkmet, Amun, Mut, Khonsu, Thoth, Hathor, sucking from Tawsert. 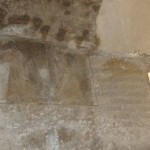 In many of the offering scenes Horemheb seemed to be followed by his wife or members of his court. 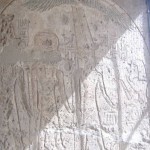 He had two wives but Amenia died before his accession as pharaoh so his queen was Mutnodjmet (possible sister of Nefertiti). 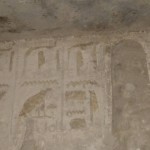 We found a hieroglyph new to me, which seems to shown foreigners similar to that depicted on the temple of Medinet Habu, with hair sticking straight up from their head and a head band. Maybe an early punk rocker. There was a scene of Horemheb being carried along in a on the shoulders of his servants who were wearing feathers in their hair like Ma’at. In front another servant was busy waving a large fan. There were servants preparing the offerings and the relief work although often damaged showed this presentation of legs of beef clearly. 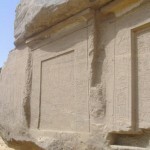 There was a large inscription which looked like hieratic high up on one of the walls. 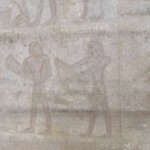 Next to it was a scene of a court official offering to Pharaoh. 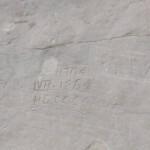 Graffiti on the outside included a mention of the British Army and Egyptian Camel Corp; Winston Churchill actually served in this corp.
Leaving the speos and going along the path we came across many inscriptions carved into the rock by later pharaohs. The area is very clean and the sand is like beach sand. There were beautifully preserved stele carved into the side of the hill along the path. Also there was lots of evidence of ancient quarry which was awe inspiring, the clean sharp lines left by the removal of the stone, dwarfed you. 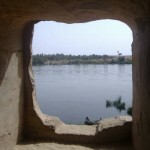 There were other chapels cut into the rock with paint remaining and the men helped us clamber through into the chapel where you had a lovely view of the Nile. There were 9 statues in this chapel. 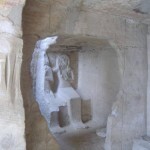 Further long we came to yet another chapel that had lost its top but the feet and legs of the statues remained together with two rectangular holes which looked like graves. The policeman told us they were tombs. There was one place which had a number of large holes cut into the rock and we were told this was where the ancient boats used to tie up. We did not go over to the other side of the Nile but apparently there is more to see there as well. 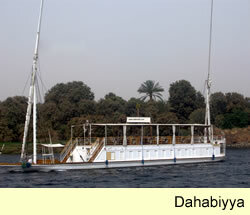 We shall certainly be going back and sailing the Nile on a traditional sailing boat, is the ideal way to enjoy both the Nile and this site. And these larger vessels with proper facilites are perfect.